Parts one and two of this set on new Charlton and Greenwich developments mainly covered the Peninsula. 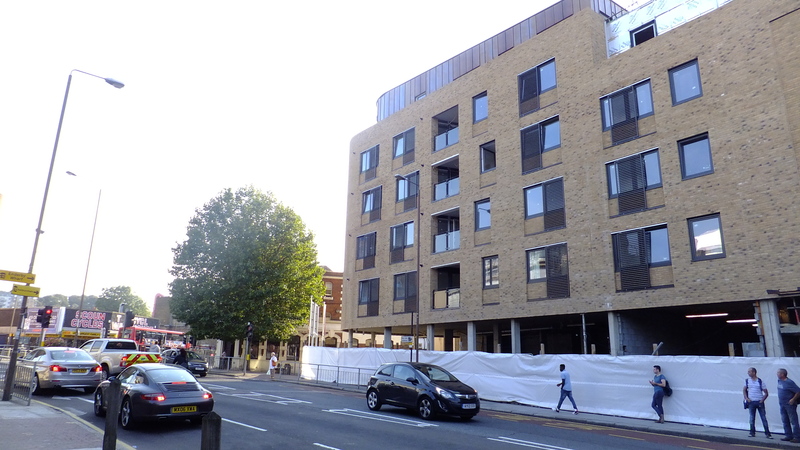 Part three today moves into Greenwich ‘proper’, covering new developments in East Greenwich at Blackwall Lane, ‘The Peltons’ on the same road, and ‘Greenwich Square’. Moving on from the riverside area covered in part two, I walked inland along Banning Street. The extremely uninspiring recent development at Lovell’s Wharf revealed many empty retail units at smaller blocks away from the riverside. An all too common story with new developments in London. Without meaning to drift off into nostalgia and ‘it was all better in the past’ wallowing, the well kept streets, houses and gardens here reminded me of how much of Abbey Wood, Plumstead (and other places further out from zone 2-3) had looked like before widespread neglect set in from the late ’90s. Now many houses in those areas are owned by lazy ‘slumlords’. In the vast majority of cases, their buy-to-let energies do not extend to keeping gardens and buildings in decent condition. Greenwich council also put about as much effort into their managed communal areas and streets as the landlords do with their houses, to obvious negative effects environmental effects across too many areas. 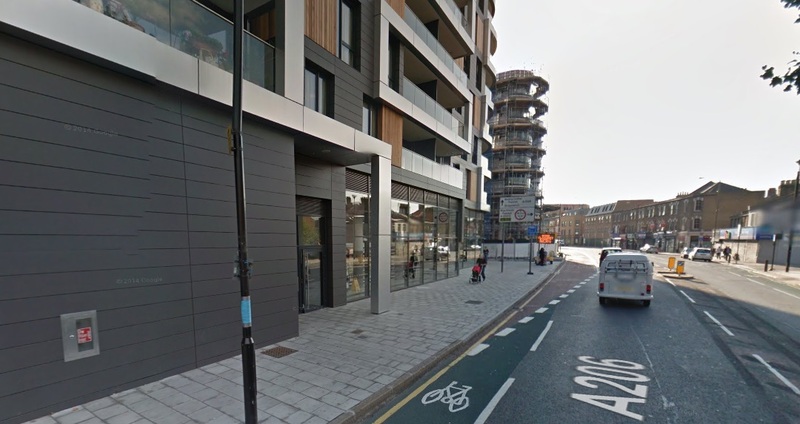 Moving back towards Greenwich, and opposite Meantime’s brewery is a development I had no idea even existed. Seen above, it is by Mulberry Development and comprises 20 flats. Click here for an in-depth planning document. Directly next to this is a small ‘pocket park. In August it was revealed that Greenwich Council are looking to sell this small patch of green. From here I strolled down towards the awful road junction with Trafalgar Road. 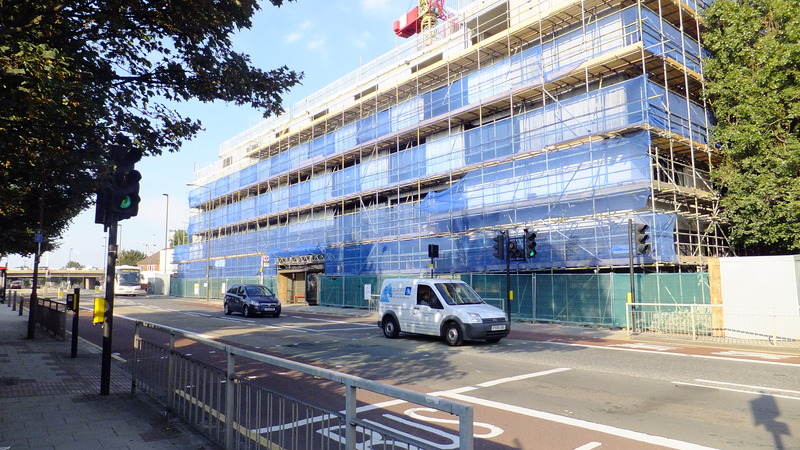 Along a long stretch of western Blackwall Lane is the new ‘Peltons’ development, comprising 138 new homes. The building integrates well with the existing streetscape and retail nearby. 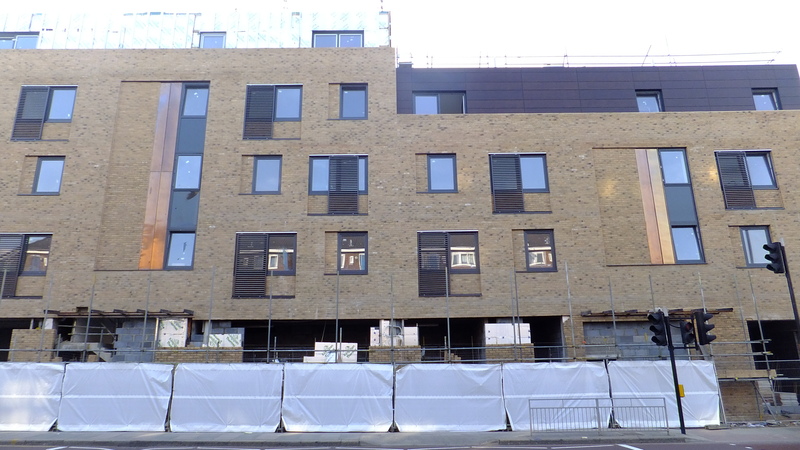 The windows along the Blackwall Lane frontage seem meagre, and attempts to disguise this don’t really work. It looks like the ground floor will be commercial for a decent stretch of road. There’s scope here for many interesting shops, pubs, bars etc to improve the area. Will high rents once again prevent this? Things like micro-pubs are springing up all over the country and one or two here would be ideal. I know there’s people who would take it on if the rent is affordable. 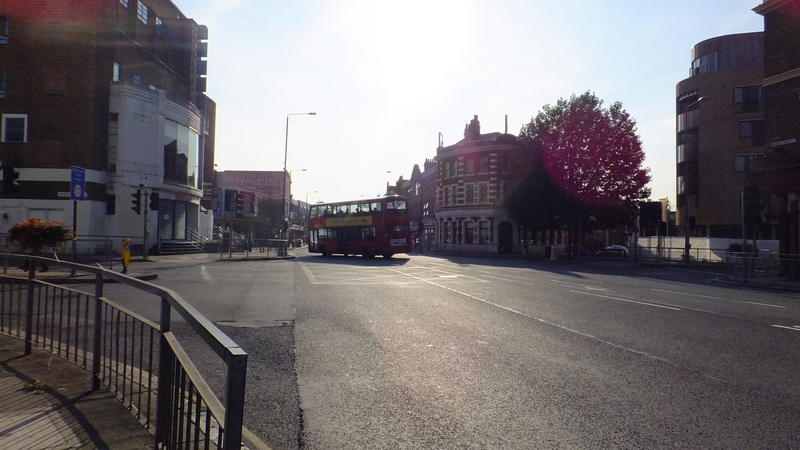 The corner faces onto the aforementioned junction with Trafalgar Road. This is a very poor environment for pedestrians, who are squashed behind barriers and guardrails on all approaches to the junction, which is a huge swath of tarmac. 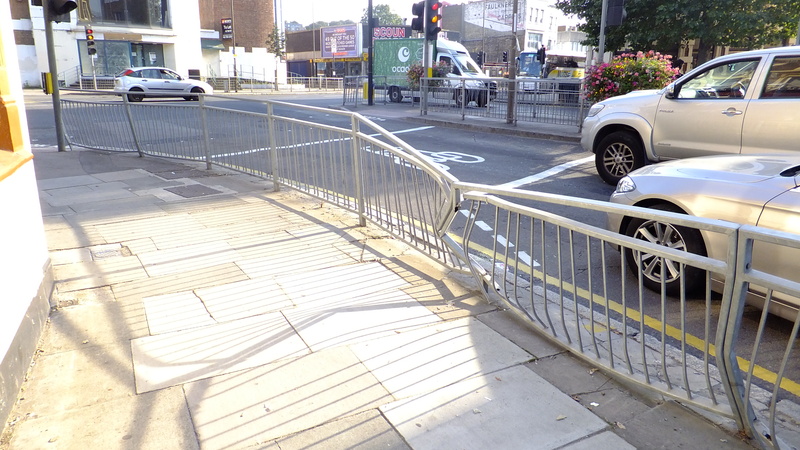 Pedestrian cages are used in the middle of all roads facing the junction, in order to restrict pedestrian movement. This is dated design, and been phased out in many areas for years now. Though not an easy junction to remodel, this area surely should be a main priority for the council to rectify. It’s a blot on the area. It’s an embarrassment to Greenwich. You approach an incredible world heritage site through an area where the local authority cannot be bothered to put any effort in. They havn’t even bothered painting them or using street furniture that isn’t the very cheapest, utilitarian possible. This kind of rubbish would not happen half a mile down the road in West Greenwich. For as long as I can remember it always appeared when heading away from West Greenwich, past the Naval College and towards East Greenwich, that the thinking of Greenwich council changed from one where they had to put effort in, as it’s a world heritage site with a Royal Park, to one where they reverted to their normal attitude of ‘that’ll do’. Laziness and incompetence in public realm and street design abound. But Greenwich town centre shows they can do it. They don’t have to stick endless crap lamp-poles, signs, guardrails, paving, crossings and more all over much of the borough. And I don’t wanna hear them moan about no money. There’s many new development nearby giving the council money to be used. And these modest improvements aren’t exactly pricey to begin with. There’s plenty of other examples across the country the council can look towards for ideas, and I’ll come back to this in a later post. Opposite ‘The Peltons’ is Make architects’ ‘Greenwich Square’. 645 homes will eventually appear along with a new library, seeing the existing East Greenwich library closing. A new leisure centre will also open resulting in the closure of Arches leisure centre. This site was formally home to Greenwich District Hospital, until replaced with the PFI disaster that is Queen Elizabeth Hospital at Woolwich in 1999. 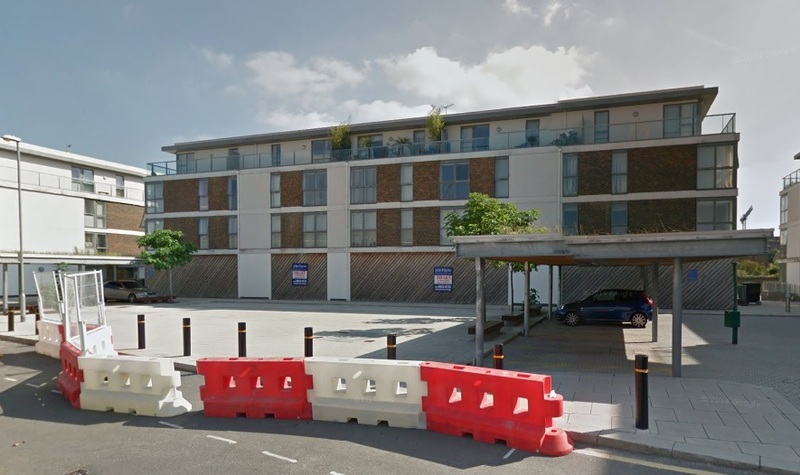 The site lay empty for a decade as developers sat on the land without building, changing name from ‘Heart of Greenwich’ to ‘Greenwich Square’. The exterior is adorned with grey trespa cladding. The same cheap plastic looking material famously covering Woolwich Tesco, though this is a lighter shade. The developers say it’s silver. On a cloudy day it looks grey. Dreary. It doesn’t look too bad above on a beautifully sunny late summer day, which is hardly the norm. There’s stingy, narrow horizontal bands of windows. Another prominent development in Greenwich borough on a busy town centre street that falls below expectations. The entrance to the completed block seemed a pretty miserable space when I passed. The space was covered in bin bags by the front door in a pretty uninviting area. Out front the existing cycle lane meets the beginning of a bus lane, leaving cyclist dicing with buses pulling in. 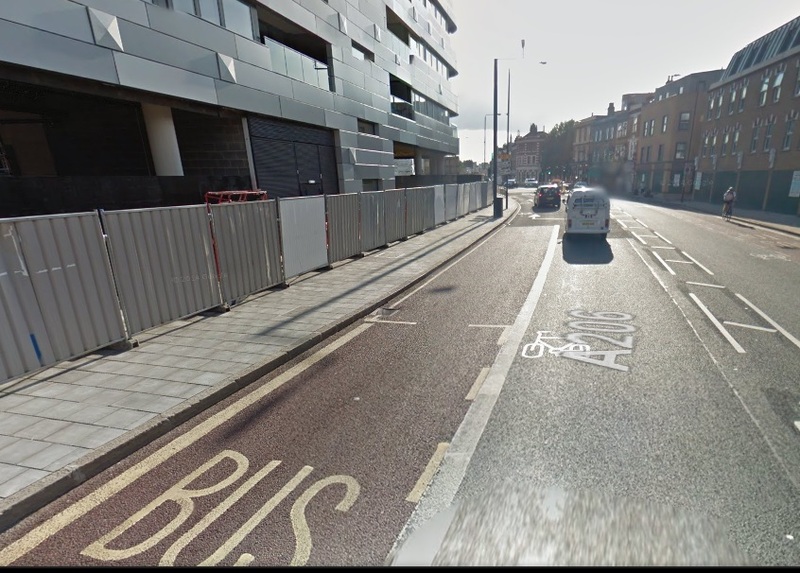 There’s enough space here for the cycle lane to have move onto the pavement into a segregated lane. This option doesn’t look like to have been taken. It’s things like this which greatly increases dangers for cyclists and puts many people off attempting to. This development presented a clean slate to re-imagine layouts; how hard would it be to install a cycle lane away from the congested road? To the rear of this development is a really quite good building in the form of Greenwich Health Centre. It shames its new Greenwich Square neighbour. The only remaining building from the sites former usage as a 1960s built hospital, it is to be demolished which is a great shame. Imagine this with the external concrete frame cleaned, years of grime removed, and instead the building presenting the brilliant white stone-like shade of new concrete. 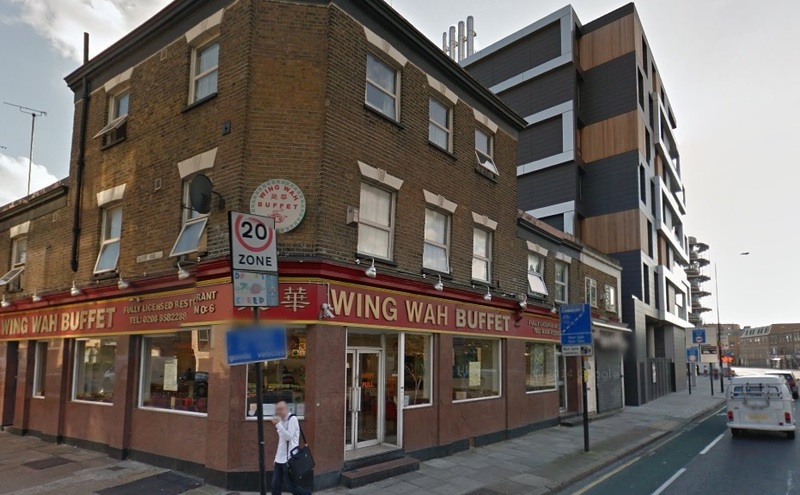 Also next to Greenwich Square is the Wing Wah Chinese buffet restaurant. 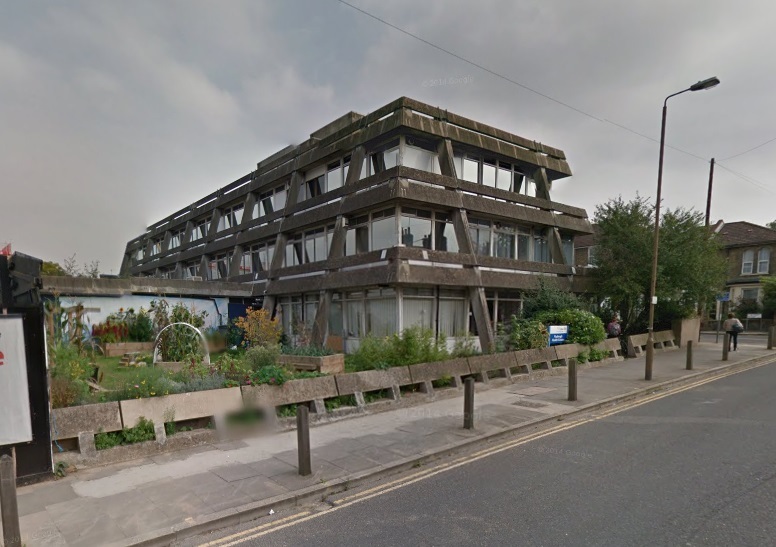 Demolition of this fine building has just been approved for an insipid small block of flats. 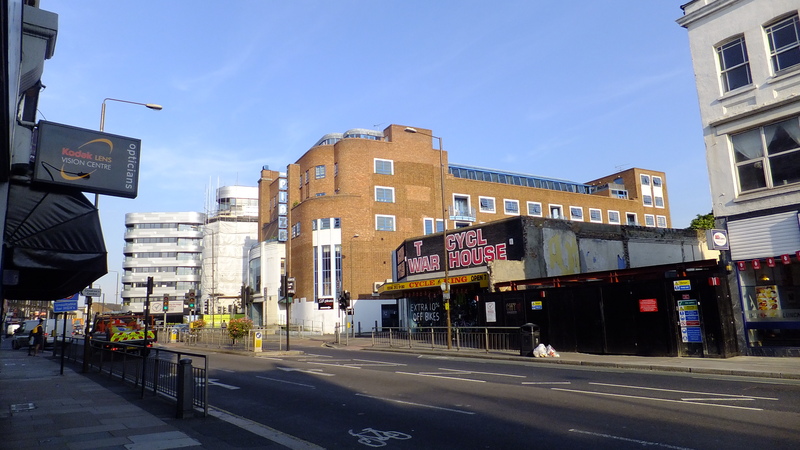 A bit further along towards Greenwich town centre is the cycle shop, which looks in a bit of a sorry state. Next door is an empty plot. This looks like a prime site for future development. Anyone aware of plans here? I’ll wrap up the post at this point. There’s a fair few things happening just down the road in central and west Greenwich which I’ll cover in the next post. I found many of the new buildings in the area underwhelming. 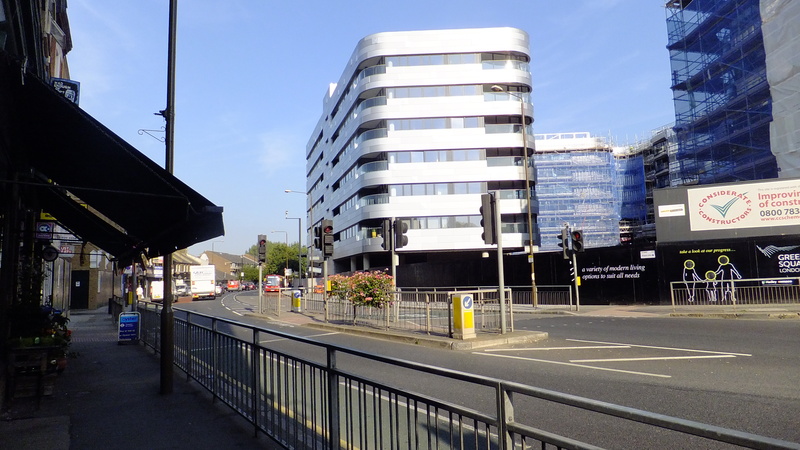 Particularly the flagship development at Greenwich Square when viewed from surrounding streets. ‘The Peltons’ is the best of the bunch. The large number of retail units included there should make the area a better destination with a greater amount of interesting and independent shops, if rents encourage this. The public realm is as bad as ever though. To attract more people to the area and encouraging them to stay, then improving that is a must. You mention the retail units below the Peltons: I hope they fare better than those in the Plaza, almost opposite, another couple opposite the Greenwich Square development and also the one at the bottom of the building facing The Arches (replaced the Victoria (?) pub). I wonder if it is the developers looking for too much rent for the type of businesses that want to start there? Do they always hope for “aspirational” businesses to match the apartments below? The conventional wisdom seems to be that the ground floors of all new developments must be retail shops, cafes etc to bring some life and animation to the streets. But the result is that we simply have too many shops for which there is no demand at a time when we are changing our habits to online shopping, click and collect and so on. To add to Chris’s list, another good example is on Creek Rd where the shop units have stayed empty and the developers have tried to convert them to residential. The new population at New Capital Quay hasn’t made them viable and soon there will be even more shops on the Family Mosaic development on Creek Rd nearer the town centre. Obviously ground floors on busy streets aren’t attractive places to live but we need imaginative solutions or we are going to see a lot of blank frontages. Saint Joseph church, Pelton Road, East Greenwich. Four weeks ago I asked the Managing agents for the Pelton’s marketing suite apartments to remove their advertising board from the wall of Saint Joseph church in Pelton Road East Greenwich as the being a sacred place of worship. They have decided not to. Just goes to show these big developers don’t want to listen to locals and their concerns. This all sounds very negative. 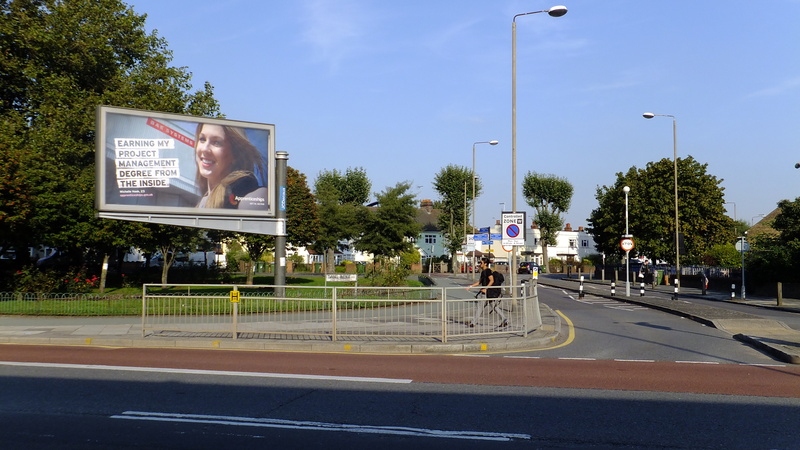 Consider what the area around Blackwall Lane looked like 10 or 15 years ago. Car wash. A dirty, shack-like structure of a bicycle shop. A bingo hall. Altogether a great example of post-industrial wasteland. With most of the old junk removed, there’s hope the area might become nicer, bit by bit. What we need is some greenery and I’ve contacted the council about that. 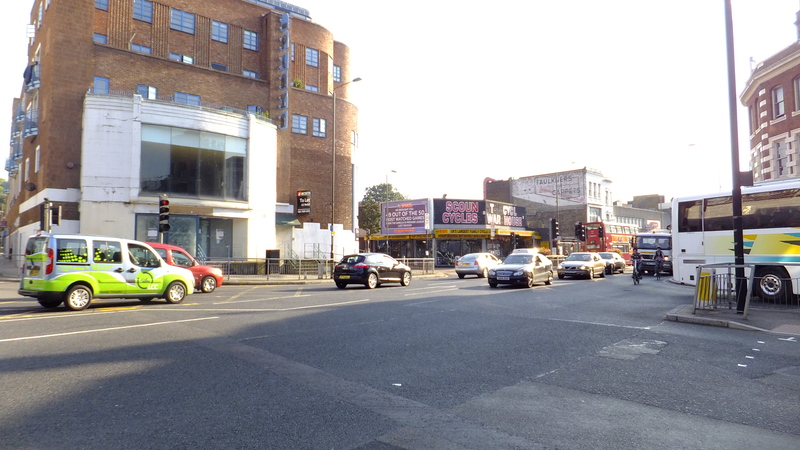 Blackwall Lane hasn’t much space available on either side, but the intersection should be cleaned up. On a final note: the windows in the Peltons development aren’t small at all. If you want to see small windows, look no further than a 1980s or 1990s house. Tea towels are bigger.